This article will explain what kind of disease gout is, what its symptoms are and how the excess uric acid causes arthritis. 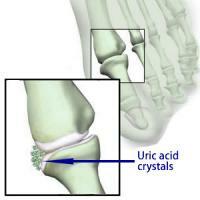 What is uric acid and can it cause gout? Uric acid is a substance produced in the liver metabolism of the purine derivative, a type of protein present in the food that people eat. 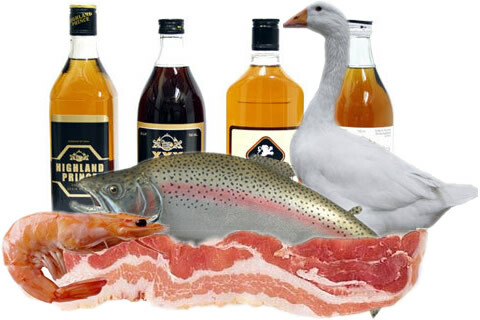 The more purine is eaten, the more uric acid is produced by our body. During the evolution of species, the human has lost the ability to produce an enzyme called uricase, which transforms the uric acid to allantoin, a much more soluble substance in the blood. As a result, humans present uric acid levels much higher than most other mammals. Our blood uric acid levels do not reach toxic levels only because most of us can eliminate the excess through the kidneys. In women of reproductive age the levels tend to be slightly lower due to the influence of estrogen, which enhances the elimination of uric acid by the kidneys. 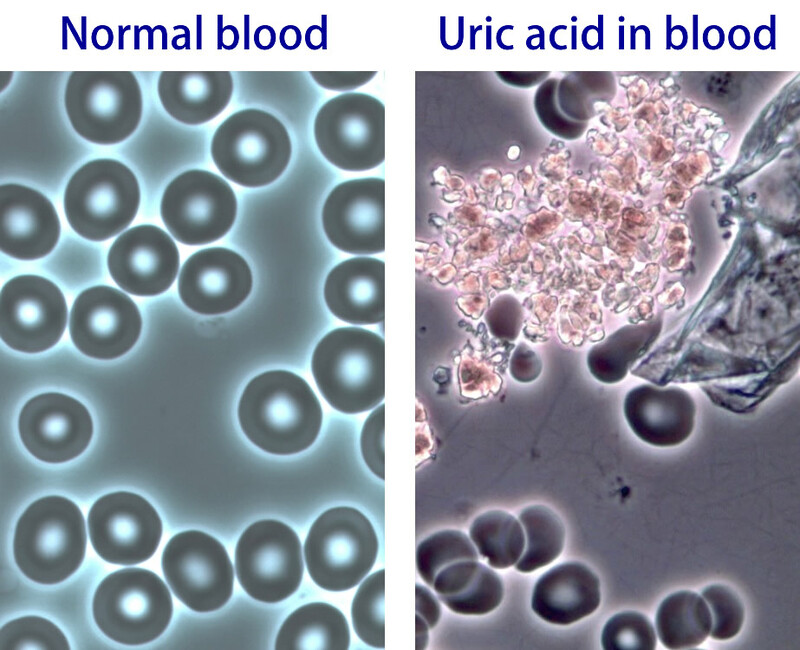 Despite a good condition of the kidneys, still our normal blood levels of uric acid are very close to the solubility limit, so little by little it increases in concentration, which causes precipitation (crystallization) of the tissues. Uric acid is more soluble at temperatures above 37 °C, which is the temperature of blood. However, in our joints the temperature is lower, reaching 32 °C in some of them, which favors the deposition of crystals in these locations (tap on your knee and compare this with the temperature of the thighs or legs). Uric acid is deposited in the tissues in the form of sodium urate. When there is deposition of uric acid crystals (sodium urate) in joints, they cause an intense inflammatory reaction leading to very painful arthritis (inflammation of the joints) that is called gout. 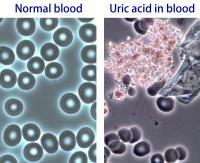 Summarizing: Uric acid remains dissolved in the blood to levels approaching 7.0 mg / dl. From this value, the higher the concentration is, the greater is the chance of crystallization and deposition in tissues, especially in the joints, which are regions of lower body temperature. If the concentration of uric acid blood continues rising, crystallization can occur over the same hottest tissues such as skin. Importantly, however, that it takes a few years of high uric acid to develop gout. The elevation of blood uric acid, called hyperuricemia, causes no symptoms. In fact, more than two thirds of people with high uric acid do not even suspect the fact. The fact of not causing symptoms does not mean, however, that high levels of uric acid cannot lead to complications. The two crises are the most common - gout and uric acid stones in the kidneys. Some people with a history of gout refer desquamation of hands and feet when uric acid levels are elevated. In fact, there is no proof of such relationship. Desquamation of hands and feet is usually caused by dry skin and not by high uric acid. The clinical manifestation of gout is arthritis, or inflammation of a joint characterized by pain, redness, swelling and local heat. Gout is classically a monoarthritis, i.e. 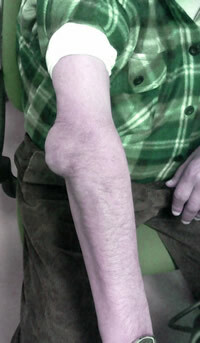 arthritis affecting only one joint in each crisis. The joints most affected are the feet, especially the first toe (big toe) and knees. The arthritis of gout is so painful that some people cannot even cover the feet, but only contact with the blanket because the inflamed area has a very strong pain. There may be chills and fever, simulating an infection. Notice in the photo above of a gouty arthritis of the thumb, with swelling and redness of the same. The gout attack lasts a few days and then disappears spontaneously. The interval between the first and second crises can last up to two years. If untreated, the attacks of gout start to become more frequent and severe, can affect more than one joint at a time. Over the years the untreated drop leads to the formation of tophi joints, chronic condition caused by deposition of urate crystals. The tophi may be single or multiple, leading to deformities as in the photos below and beside. This phase of gout is called tophaceous gout. Excess uric acid can also lead to the formation of kidney stones of uric acid. There is also the risk of urate deposition and formation of tophi in the kidneys, causing chronic renal failure. As already explained, the drop is caused by prolonged high levels of uric acid in blood. However, not everyone having high uric acid develops gout. Some people may have uric acid levels greater than 7 mg / dl for several years and never have gouty arthritis and kidney disease. Yet nobody knows why this happens. Gout is more common in men and occurs between 35 and 45 years. In women usually only occurs after menopause. 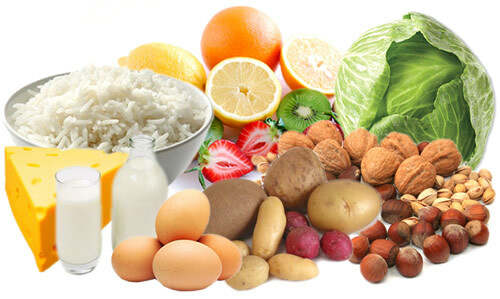 Milk, tea, coffee, chocolate, thin yellow cheese, hard-boiled eggs, cereals such as bread, pasta, cornmeal, potatoes, white rice, maize, cassava, sago, vegetables (cabbage, cauliflower, lettuce, spinach and watercress), nuts, sweets and fruits (even acidic). Diagnosis is done when there are typical clinical signs associated with high levels of uric acid. When there is doubt about the cause of arthritis, the doctor usually punctures the fluid from the inflamed joint, looking for deposits of urate crystals. The treatment of gout is divided into two phases: treatment of symptoms and prevention of new crises. Gout is not curable, but can be very well controlled. During the crisis of gout patients are treated with common anti-inflammatory drugs (NSAIDs) and / or colchicine. Colchicine is less toxic than the anti-inflammatory (especially for the kidneys and stomach) and effectively controls gout, but can cause unpleasant side effects such as nausea, vomiting and diarrhea. This adverse effect is generally related to the dose used and is less common in low doses. For patients who cannot tolerate NSAIDs or colchicine, an option is the use of corticosteroids, potent anti-inflammatory steroid source. Aspirin (acetylsalicylic acid) should be avoided whenever possible, for the same, despite anti-inflammatory effect, it reduces the excretion of uric acid by the kidney. Once the crisis of gout stopped, the treatment turns to decrease levels of uric acid. The most widely used drug for this purpose is allopurinol. Importantly, one should not start allopurinol during crises because there is a risk of worsening. Allopurinol during crises is only acceptable if the patient has had chronic use of it before the crisis. It is suggested to keep colchicine to prevent new crises if uric acid levels are not reduced by allopurinol. It may take a few months of treatment until desired levels are achieved. Another option for lowering uric acid levels is probenecid, a medicine that increases their elimination by the kidneys. Probenecid should not be used by patients with a history of kidney stones uric acid. Since 2008 there has been new measuring instruments called Febuxostat, which serves as an alternative for patients who cannot take or allopurinol or probenecid. Since most patients with elevated uric acid do not develop gout or kidney stones, they are not proscribed to allopurinol use. People must get drug treatment if there is a first crisis episode of gout, kidney stones, or if the uric acid levels are above 13 mg / dl for men and 10 mg / dl for women. 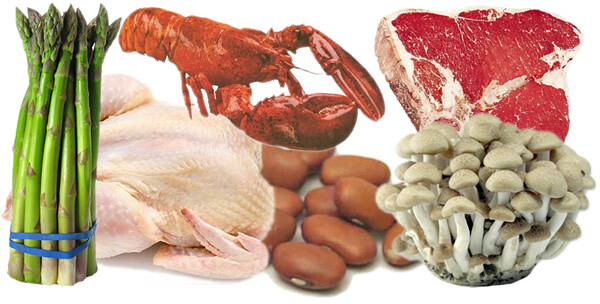 Patients with asymptomatic hyperuricemia are advised to change a diet, in order to avoid foods high in purines. I've heard about the ways to prevent gout. 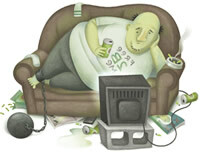 First, you have to drink about 3 litters of liquid a day, at least once a week you should comply with a vegetable diet. Regularly consume cranberries, red and black currants, cherries, strawberries, apples, and tincture of garlic.